Upscale Blue Ridge GA Cabin Rental Located in the Beautiful North Georgia Mountains. Great for Fun Weekend Get Aways, Vacations, Family Reunions, Honeymoon & Anniversary Celebrations!!! Our North Georgia Cabin Rental is in the Blue Ridge Mountains of North Georgia. Luxury Rustic Cabin with 3 bedrooms/2 bathrooms, Extremely clean & Sanitized mountain Vacation Rental. 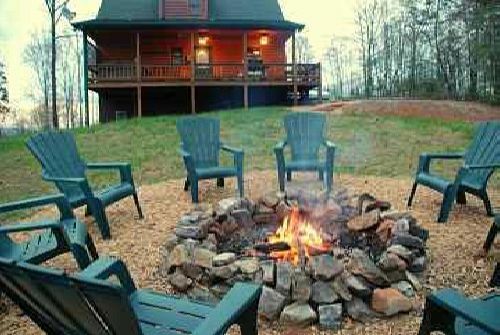 Cabin is located only 13 minutes from Blue Ridge and 5 minutes from McCaysville. Very Convenient Tri-State Area. Within 20 minutes, you can drive through GA, TN & NC! How neat is that??? Our Blue Ridge Cabin Rental is Fully Equipped, Clean and Affordable! Year Round Mountain Views, Game Room (with pool table & foos ball & Air Hockey & Electronic Dart Board), Private Hot Tub, Indoor Wood Burning Fire Place, Outdoor Camp Fire Pit, Gas Grill, High Speed Internet, Cable TV, DVD Player in each bedroom & Living Room, Extensive DVD Movie Library, Board Games & Puzzles, Rocking Chairs on the Porches. There are plenty of extra sheets, blankets, pillows, towels & washcloths, and hot tub towels. Bathrooms include hairdryers. Our fully equipped kitchen includes pots & pans big enough to cook for a large family gathering, includes the pans and necessities needed for baking; dishes, cups, wine glasses and silverware. You will have everything you need, and more, in this very convenient kitchen. Seating for 6-8 people. FREE! : Coffee, Filters, Creamer, Sugar, Dish Soap, Dish Washer Det., 1 Roll Paper Towels, 2 Rolls Toilet Paper, Garbage Bags, Laundry Detergent. FREE fire wood & fire starters are provided for fire pit and indoor fireplace! For toddlers we provide: Potty Seat, Toddler Toilet Seat, High Chair, Pack & Play, Safety Gates, Baby Monitor, Baby Bath Tub, Booster Seat for eating. Included in the cabins are: Extensive DVD Movie Library, Iron & Ironing Board, Hot Tub Towels, Flashlights, and Gas Grill Utensils. Our goal is to make your life easier while on vacation. We have provided many extra small amenities & extras to make your day run smoother, lighten your suitcase and keep more money in your wallet! We recommend no more than 6 guests (Adults and Children). Please do not book this cabin if you have more than 8 people, but if you have more than 6, we must charge an extra $50 cleaning fee. 2 night minimum, but we reserve the right to decline requests of less than 4 days over holidays and holiday weekends. This is also my family's cabin. We love and cherish it, so please do the same. 2 bathrooms. Both have double vanities. Oh yes.... Majestic mountain views all year round! Gorgeous!!! Need to use a long distance calling card. Best cell phone companies for the mountains: AT&T, Verizon. Central A/C & Heat available all year. Hot Tub Towels provided also. Fully Equipped Kitchens. No need to bring anything with you. Cable TV with individual remote controls. Netflix available with your account. Lots of Board Games. NO GAMING SYSTEMS ARE PROVIDED. Cabin has extensive DVD Movie Library. Many different types of movies. From Wilderness style, Chick Flicks, Children's Movies, Action, Comedy. Rated G, PG, PG13, R.
Large 1 acre yard to enjoy the outdoors. There are two steps from the driveway to the main floor. Cabin includes the following: Very Easy Access Road, Beautiful Long Range Year Round Mountain Views, Child-Friendly Back Yards to Play and Run, Private Covered Deck Hot Tubs, Game room with pool table & foos ball, air hockey & darts, Fire Pit w/seating, Rocking Chairs, WiFi, Rustic Stone Fireplace, Phones, Central Heat & Air Conditioning, DVD/CD Players, DVD Library, Double Bathroom Sink Vanities, Front Loading Washer & Dryer, Board Games, Pack N'play, Folding High Chair, Potty Seat, 2 Safety Gates, Smoking Allowed on Outside Porches/No Pets. This was a perfect getaway spot. It was close to so many activities and different trails and other outdoors options. the cabin was perfect and had everything we could need. we will definitely be coming back. Everything you need is there. Just bring your clothes. Had a wonderful trip . Cabin is close to everything. Fully equipped for children. I can’t say enough about this property. It is absolutely amazing. The location is perfect, almost like its tucked away, just a few minutes drive from the main road but it doesn’t feel like it. The cabin is extremely clean and very well stocked. Plenty of towels, kitchen tools, firewood, blankets, a grill, a game room, everything you could need. The owners have everything labeled, takes the guess work out of switches and how things operate. The layout is perfect for families, the master is on the main floor and children’s bedrooms upstairs. Our favorite part had to be the amazing back yard and fire pit. We spent hours outside playing yard games, kids were exploring and we started a fire every night at sundown. We would love to stay here again. This cabin had everything anyone could want for a get away! Had a great time and will definitely return!! We loved the cabin and the beautiful scenery around it. We'd love to return sometime and stay again. There were many things we wanted to do in the area but didn't because some of the people in our group became ill with influenza. We were very impressed with the accommodations. We hiked quite a bit and took the train ride. After leaving 9° weather in Michigan we were so comfortable in the Georgia climate. Just beautiful! This was our second cabin trip ever. We tried a cabin in Alabama last year and HATED the experience and we thought that maybe we just weren't cabin people. I am so grateful that we decided to give cabin life a second try! This cabin was a true gem. The game room was immaculate and we spent several hours playing pool over our stay. The hot tub was large and well maintained. The living area was large enough for four adults and two kids. The kitchen had every spice that you could want. The cabin was clean and well stocked. The large window in the kitchen has a stunning view that distracted us from even turning the TV on once. We enjoyed coffee on the porch every morning and a glass of wine every evening marveling at the mountains. The fire pit was perfect for smores. There are two thermostats- one for upstairs and one for the main floor and that was honestly so amazing and an unexpected surprise. It was a super easy drive. Honestly, if you are considering this cabin, we highly recommend it! We are already planning a return trip.